How to Survive a House Fire - Keep You and Your Loved One Alive! How to Survive a House Fire – Keep You and Your Loved One Alive! Fire is one of the deadliest events that can strike a home. The sad fact is many people every year lose their homes, or even their lives, to fires that could have been stopped if they were caught early. Those of us of the preparedness mindset sometimes spend so much time on food storage, water filtration, guns, ammo, and on and on that we overlook the simple tasks. 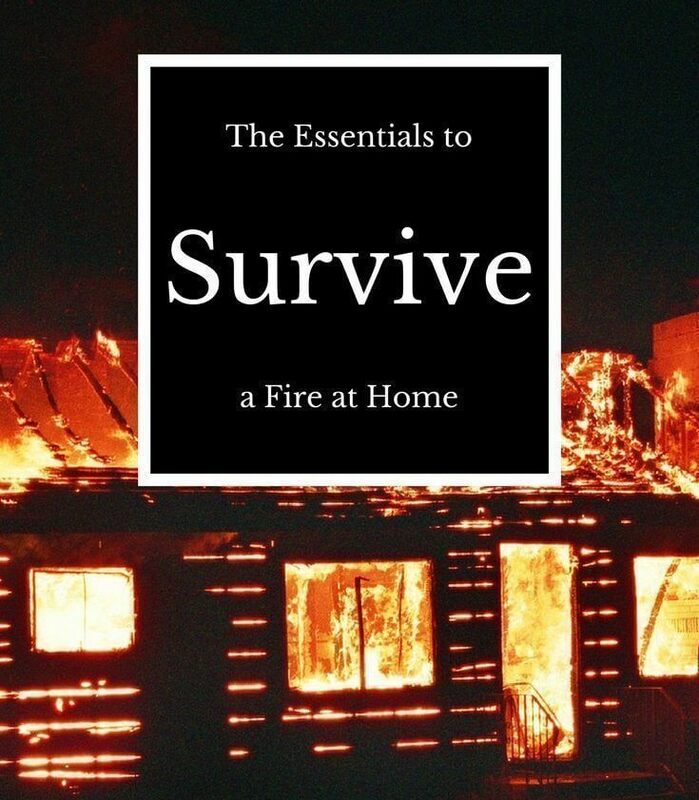 Keep reading to learn how to survive a house fire . What makes a fire so deadly? A type A fire is comprised of typical flammable materials such as paper, wood, plastic, furniture, etc. A type B fire is a fire that involves flammable liquids such as gasoline, paint, motor oil, and flammable gasses like propane. Type C fires consist of electrical equipment that has power. If power is removed, then the fire will become one of the other types. Type D fires are flammable metals and type K fires are fires that involve cooking oils and greases. Fire extinguishers are rated based on the type of fire they can extinguish. This will look something like this: 2:A 10:BC. The number is the capacity of the extinguisher to fight that type of fire. C is not rated. It simply means that the extinguisher is capable of being used on energized electrical equipment. The most common type of extinguisher is ABC. The acronym PASS is a commonly taught way to remember how to correctly use a fire extinguisher. Pull the safety pin, Aim at the base of the fire, Squeeze the trigger, and Sweep from side to side until the fire is contained. For a grease fire in the kitchen, you can use salt, baking soda or cover it with a pan. NEVER use water, this will just spread the grease or oil and the fire. If the fire is large you should use a B type fire extinguisher, making sure that the pressure doesn’t spread the burning grease or oil. You should have an extinguisher anywhere you have a higher chance of a fire. The kitchen, in the garage or any workshop type area, etc. Having one by the exits is also a common suggestion. I personally have one under each sink in the house which puts a fire extinguisher in the kitchen and in each bathroom on every floor of the house with an extra one in the master bedroom. I also have one in the garage and in each vehicle. We should never overlook the need to have a fire extinguisher close at hand. This one item makes the odds of surviving a fire much more likely. If you feel you can safely fight the fire, then you definitely should! Once you can no longer contain the fire you should evacuate and call for assistance. If you successfully contain the fire, you should monitor the area to ensure there are no flare-ups while the area is still hot. Fires kill 2,500 people a year and injure more than 12,000. Homes can be engulfed in flames in just a matter of minutes. If the fire occurs at night, while the entire family is asleep, precious minutes can be lost while everyone wakes up and gets their bearings. In cases like these, early warning is the best way to survive. If you take nothing else from this article, please ensure that your smoke alarms are functioning! Checking them once a month is recommended and replacing the batteries twice a year is a good idea. One fire extinguisher per level and one outside of each bedroom should be considered a minimum. In the case of a fire at night, a simple fire alarm will allow you to get enough notification to implement your evacuation plan. Every member of the family should know what to do in the case of a fire. The primary plan should involve the immediate evacuation of the home with everyone meeting at a pre-designated area, far enough away from the house to be safe from a fire. Once you’ve evacuated, you should immediately call 911. You also need to know what you will do if a member of the family does not make it to this rally point. Firefighters will tell you never to re-enter a burning building, but we all know this goes out the window if your children are stuck inside of your burning home. You’ll have to approach this scenario on a case by case basis. Having a plan prior to just rushing back into your house is key. Accessing bedrooms from the outside of the building may be the best course of action. If a primary escape route is blocked by fire or smoke, you’ll need another way out. Windows on the ground floor can provide an excellent means to vacate the building. If you live in a multi-story home, you should consider getting collapsible escape ladders for second-floor bedrooms. As many of us know, most fire-related deaths are not caused by the fire itself. Smoke, lack of oxygen and superheated air make up a majority of the deaths. Anyone evacuating through a smoke-filled room should crawl below the level of the smoke in order to avoid breathing as much of the smoke as possible. There are also escape hoods available on the open market, if you’re so inclined. If you live in an apartment building, choosing a ground floor apartment will greatly increase your chances of surviving a fire. Practice your evacuation plan and try to find your way out of your home in the dark with all the lights out. Don’t let combustibles like newspaper and trash pile up. Make sure portable heaters will turn off if tipped over. Clean chimneys annually to avoid chimney fires. Make sure none of your electronics have frayed or exposed wires. Ensure any fires are completely extinguished before leaving your house and store any coals outside in a sealed metal container. Learning to survive a house fire can help you plan fire drills, prepare the right equipment and educate your family! Did this article teach you how to survive a house fire? Let us know in the comments below. For more preparedness articles head over to this link.